After seeing adverts for bingo I thought I may be missing out. The thrill of the game with its bright lights and infectious laughter was beckoning me, so I finally succumbed and headed to the local bingo hall. Registering was easy all I had to do was fill out a form and have my membership card printed off, understanding the game however was not. Three employees tried to explain the price structure to me: “£5 for early and mains, then extra if you want sapphire and the national game, if you want to play the table game it’s £1 a go”. With my jaw dropped, I looked at one of the employees and said: “I have absolutely no idea what you’re talking about”. 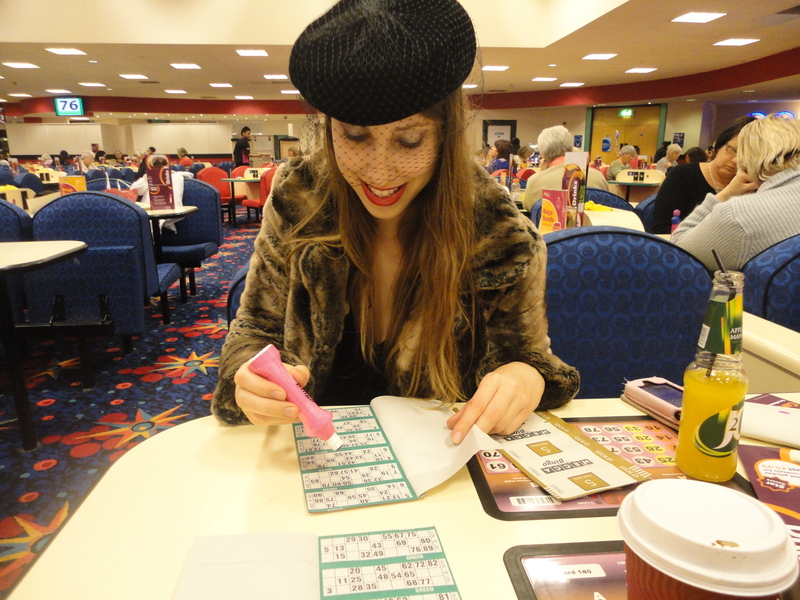 Thinking the game was mostly frequented by old ladies for their weekly trip out I decided to attempt to fit in with the formal attire with my faux fur coat, vintage pill box hat and blazing red lipstick. However my friend who had just come from the gym without showering summed it up nicely when she told me, she felt overdressed. The bingo hall was a mass of plastic tables with fold down chairs, mostly people sat on their own with pairs of elderly mothers and grownup daughters dispersed and the odd pair of love birds. I had gone for the basic package which involved 14 games, obviously I had come unprepared and not brought a pen so I was using a pencil I found in my car. The numbers were called out over a tannoy system rivalling those installed at supermarkets, you know the ones where you haven’t got a clue what’s been said. Not only were the numbers hard to hear but they were read out so quickly that I snapped my pencil lead within seconds and had to invest in a bingo dabber. Gone are the days when bingo numbers are called out by a youthful dad at the local PTA meeting with comical one-liners and an associated reaction from the crowd: legs 11 anyone? Instead a monotonous voice read out the numbers in a logical but boring manner, eight and eight, 88, where are the two fat ladies? or is that no longer politically correct? To top it off people don’t even say “bingo”! Instead they shout: “over here” or “oi”. I have no idea why the adverts portray the place as fun and exciting as most of the guests looked like they were waiting for a funeral to start and as soon as someone wins the whole crowd mumbles in disappointment. The most confusing aspect of the place is the food ordering system, you can’t go up to the bar and order, you have to sit on your fold away chair and hold your menu in the air, I held mine for about ten minutes before someone came over. Because the numbers are called so fast people attempt to eat main meals in-between the games, I amusingly watched one person taking a bite of her food only for the next game to start unexpectantly causing her to throw her fork across the table in preparation. Surprisingly my friend and I didn’t win and left empty handed, I have to admit I am a bit disappointed, I expected a fun filled evening of whimsical excitement. Instead the night resembled a mass of people filling in forms in silence and paying for the pleasure of it.